This month’s guest is Nina Sadlowsky, blogger, yoga teacher, intuitive coach and Wellness Advocate for dōTERRA. Nina and I were colleagues at ADA, a company that partners with beautiful brands to provide beauty products to luxury hotels. We bonded over a shared love of dancing, exploring London and generally saying yes to things. Since then Nina has moved back to her hometown Munich, but we’ve kept in touch and continued to share our passions, travels and discoveries. 1. Hi Nina, thank you for being my Insider Q&A guest this month. Tell me about your transition from beauty marketeer to wellness guru. I graduated in business administration and directly landed my first marketing job at L’Oréal Germany after completing an internship. Three years later I was looking for a change in industry, but only 6 months into the new job I realised that my desire to change went deeper. What I was looking for was a lifestyle change, personal growth as well as living a happy, healthy and abundant life. Following a change in my personal life at the end of 2014, I got into yoga and meditation and ever since, I’ve started to actively design my life. I strongly felt an itch to make my passion my work whilst satisfying my travel lust. As a result, I’m now a yoga teacher, training as a coach, and as a wellness advocate for dōTERRA my passion for natural health and beauty is now reflected in my work. I’ve been using essential oils for a long time, but when I recognized the amazing physical and emotional benefits of essential oils, I was completely sold on incorporating them into my practice to help others live a healthy, happy life. Hence, I wouldn’t call myself a guru, I see myself more as a facilitator, supporter and inspirer. 2. What does your role Wellness Advocate for dōTERRA entail? It’s a very versatile role, that’s for sure. Being a wellness advocate means educating myself about essential oils, understanding their physical and emotional benefits and knowing their different ways of usage and application. It also includes educating others about the essential oils and sharing my knowledge and experiences in the oil classes that I hold or in one-on-one chats. It means connecting, coaching and networking with other people, through all available media, online and offline. And of course, it entails marketing, which brings me back to my roots, haha. Overall, I see my role as bringing more natural health to as many people as I can. 3. How do you incorporate oils into your yoga practice and yoga classes? In my own yoga practice, I diffuse them, there are so many different combinations, ranging from calming lavender, invigorating lemongrass, cleansing lemon to peppermint for more clarity. In my yoga classes, I love using the oils for a massage whilst my students enjoy the end relaxation Savasana. My favourite oil for that is Lavender or Balance, an oil blend by dōTERRA. And, when mixed with distilled water, the oils are great to spray onto your yoga mat, too. 4. What oils would you recommend for dry/sensitive skin, oily skin and anti-aging? Lavender is great for dry and sensitive skin, it soothes irritations, dry spots and has a calming effect on stressed skin. Basil is also nice for sensitive skin and soothes insect bites. Frankincense is a very popular anti-aging oil, as it regenerates skin cells, tones, tightens and can help with pigmentation. Tea tree/Melaleuca, Lemongrass and Ylang Ylang help with oily and acne prone skin. I’ve just mixed my own eye serum with 1 drop Frankincense and 1 drop Lavender diluted with coconut oil. Apply morning and evening and the fine lines around the eyes will fade. 6. What exciting projects do you have coming up in the next few months? I’m going to teach more yoga classes and tonight I’ll hold a three-hour workshop named FEEL UNDERSTAND HEAL in Munich combining yoga, mindset coaching and essential oils which is something new. 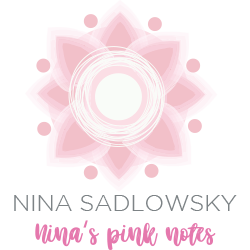 My coaching training runs until September and as part of this I’m sharing my learnings and experiences with others on my Facebook page ninaspinknotes. My page and work is suitable for action takers, keen to drive their personal growth and committed taking that extra step to get closer to their true self. I also really want to get into public speaking, so I’m connecting with like-minded people who are already a step ahead of me. And very soon I will start my own podcast, which has been part of my vision for a while now. Stay tuned! If you have any burning questions you’d like to ask me why not leave a comment below? Or you can get in touch with me directly by messaging me here, on Instagram and Facebook.